The UCLA Hyperbaric Medicine specializes in the management of complex wounds, decompression sickness (DCS), late radiation injuries and several other medical conditions. Our hyperbaric and wound-care-certified physicians, nurses and technicians work with a patient's primary-care physician and ancillary services to tailor a treatment plan that seeks to ensure the best possible outcome. Our multi-place chamber operates 24 hours per day, seven days a week, and is capable of providing care to both outpatients and critically ill inpatients. 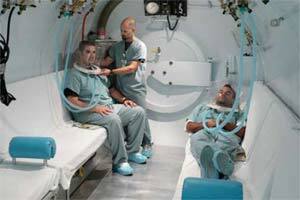 Due to the increased atmospheric pressure of the hyperbaric chamber, high levels of oxygen dissolve into the body's bloodstream resulting in a high level of oxygen tension in the body's blood and tissues. This increase in oxygen concentration promotes the healing of certain wounds.